I am planning to start a series of regular online broadcasts discussing how new technologies can be used to make older people’s lives better and break down social isolation. The broadcasts will be via Google Hangout, all you will need is a laptop, tablet or smartphone and an internet connection and you will be able to take part. If you would like to be involved, please let me know. And please don’t forget my DigiCamper crowd funding campaign to launch the Digital Inclusion Campervan. The title of this post is a quote from 83 year-old Margaret, the subject of Episode 5 of Sky 1’s “OAP Internet Virgins“. This excellent series continued last Thursday with another brilliant case study of how to ignite older people’s interest in the internet. 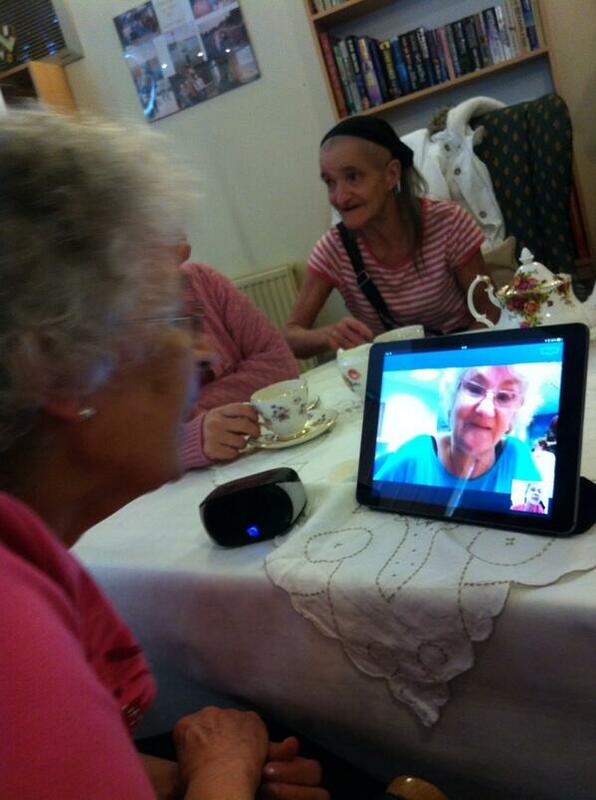 This time, Youtuber Harry Hitchens was leading Margaret through her first steps online. Avid knitter Margaret was soon marvelling at the time that would be saved searching for wool shops as she saw them all laid out on Google Maps. She gave the lie to the idea that older people are not generally online, as one of her drivers was that all her friends are “… on everything except me, So now I can join them”. The quote in the headline came after Margaret had attended a craft class which she had found and booked online. And this is an important point. To those who think that being digital means being sat at home staring at a screen, this programme, as with others in the series, demonstrated that being digital can open up whole new possibilities for going out and participating in activities which they would not otherwise have been aware of. And the programme finished with Margaret and Harry touring the district recreating in digital form the photographs that Margaret had taken with her husband who had died 15 years earlier. If you’d like to work with me on these kinds of approaches to digital inclusion please get in touch. And please don’t forget my crowd funder for DigiCamper, the ultimate digital inclusion vehicle. I would really appreciate help with getting the word out, and for any support you can give. Another excellent episode of “OAP Internet Virgins”. In Episode 3, former florist and flower arranging teacher, 77 year-old Irene, was tempted online by YouTuber and Standup Comedian Mawaan Rizwan. And not only did Irene find being online a life-enhancing experience, but by the end of the programme she was running her own YouTube channel giving instructions on flower-arranging. Once again this programme has given much need public exposure to the techniques necessary to get older people interested in the online world and to sustain their use to make their lives better in the long run. If you’d like to work with me on making this approach a reality for the people you work with, please get in touch. “OAP Internet Virgins” – Episode 2 – Wow! I’ve only just had the chance to catch up with Episode 2 of “OAP Internet Virgins” and wow! If anything it might have been better than the first one. Once again it really got to the crux of the drivers to getting older people online for the first time and, front and centre again was the fact that the internet is important to people because of the human connections it allows them to make. This week 22 year-old Roman Kemp took on the challenge of inducting 71 year-old Rose to the online world. Rose was a willing participant as her 7 grandchildren were at the centre of her life and she recognised they were living their lives in different ways to her. “I want to be in their world”, she said “I don’t want to feel left behind”. An early win for Roman was that he found they supported the same football team, Arsenal, and they were soon getting updates on the game, and sharing the joy at goals scored. They moved on to finding Rose’s favourite music, and then ventured into Facebook. Rose was joyful as her children and grandchildren started sending her friend requests. And then came a shock as she was friended by her sister-in-law in Canada who she hadn’t seen for 25 years. “How can that be? She’s in Canada” was Rose’s reaction. Roman patiently explained that Facebook is a worldwide network, and that people in Canada can use it too. Rose’s reaction was a mixture of shock, surprise and joy at the realisation that she could now be in contact with distant people she thought she had lost contact with. And it wasn’t long before Rose was using her new found internet knowledge to book a cheap flight to Canada to visit her long-lost in-laws. Just before she left, she searched Facebook to find the cousin, also living in Canada, who had been her best friend in her younger days. This search proved fruitless however, but the cameras followed her as she flew into Toronto and was greeted by her brother-in-law and his wife. It was great to see Rose Skyping her grandchildren from Toronto and holding up her iPad so they could see the unusual buses passing by. As Rose sat in a cafe telling the cameras about how wonderful her trip was, she was surprised by her cousin, not seen for 25 years, appearing at her side. Cue kisses, hugs, and many tears. As she scrolled through her pictures of Toronto on her iPad to show her grandchildren, Rose summed up her experience of working with Roman, “he’s told me not to think I am old and past it any more”. To me, this is one of the most important points about digital inclusion. Far too many pigeonhole older people as beyond learning about new technologies, and far too many older people do it to themselves. It takes a slightly open mind to start the process, and the internet generally does the job itself of opening people’s minds further once they have let it into their lives. I am so pleased that this series has continued its high standard of showing the world the methods that work where digital inclusion is concerned. If you’d like to work with me on spreading this kind of practice, please get in touch.